Digital subtraction angiography of the right common and internal carotid arteries. A, Recurrent 80% stenosis in the common carotid artery proximal to the stented segment but within the prior endarterectomy site. B, Following angioplasty and stenting with the PercuSurge Guardwire occlusion balloon (Medtronic AVE, Santa Rosa, Calif) deflated. Wholey MHand the Investigators for ARCHeR, The ARCHeR trial: prospective clinical trial for carotid stenting in high surgical risk patients: preliminary thirty-day results. Paper presented at: Annual Scientific Meeting of the American College of Cardiology March 30, 2003 Chicago, Ill.
Yadav JS The 30-day SAPPHIRE results. Paper presented at: Annual Meeting of the American Heart Association November 17-20, 2002 Chicago, Ill.
Yadav JS The 12-month SAPPHIRE results. Paper presented at: Annual Meeting of Transcatheter Cardiovascular Therapeutics September 15-19, 2003 Washington, DC. Hypothesis Carotid angioplasty and stenting seems to have equal or better outcomes in high-risk patients than carotid endarterectomy. Setting University hospital tertiary referral center. Patients Individuals (n = 53) undergoing elective carotid angioplasty and stenting for cervical carotid stenosis (n = 57) between April 2001 and October 2003. All patients were referred to and treated by the primary author (M.K.E.). Results Mean ± SD age was 68.8 ± 1.2 years (64% men  and 36% women ), and overall mean ± SD rate of stenosis was 79% ± 10%. Preprocedural neurologic symptoms were present in 42% of the group. Indications for treatment included prior neck surgery with irradiation (4), recurrent stenosis (19), and severe comorbidities (34). Duplex scanning 24 hours after stenting showed immediate mean percentage reductions in peaksystolic velocity and end diastolic velocity of 74% and 76%, respectively. After a 30-day follow-up period, there were no deaths and no major or minor strokes. One patient (1.7%) developed transient amaurosis fugax 12 hours after the procedure. Four patients (7.0%) experienced access-related complications. Intraoperative complications included 1 seizure (1.7%) and 1 asystolic arrest (1.7%), both treated successfully. During follow-up, 3 cases of re-stenosis (5.0%) occurred. One asymptomatic occlusion (1.7%) was detected at the 6-month follow-up visit. There have been no late carotid-related complications or deaths. Conclusions Vascular surgeons possessing advanced catheter-based skills can safely perform carotid angioplasty and stenting and can achieve perioperative results comparable with carotid endarterectomy. Determination of the true efficacy and durability of carotid angioplasty and stenting as compared with endarterectomy awaits ongoing randomized national trials. Since Thomas Willis' monumental publication of Cerebri Anatome1 in 1664, physicians and scientists have attempted to elucidate the pathophysiologic features of cerebral ischemia and infarction. The relatively common problem of cervical carotid artery stenosis, particularly involving the origin of the internal carotid artery, can manifest as an asymptomatic lesion, bruit, transient ischemic attack secondary to embolization or hypoperfusion, or ischemic stroke. Approximately 750 000 strokes occur in the United States annually, and 150 000 of these are fatal.Surgical treatment of carotid artery occlusive disease was given its greatest impetus by the report of Eastcott et al2 in November of 1954. Later, studies by Carrea et al3 in Buenos Aires, Argentina, and DeBakey4 in Houston, Tex, were published. Since then the primary treatment modality for severe extracranial carotid artery lesions has been carotid endarterectomy (CEA). 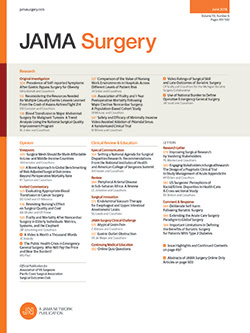 This procedure has been substantiated by several multicenter randomized prospective trials (North American Symptomatic Carotid Endarterectomy Trial5 [NASCET], Asymptomatic Carotid Atherosclerosis Study6 [ACAS], European Carotid Surgery Trial,7 and Veterans Affairs Symptomatic Trial8) demonstrating its efficacy in a subset of symptomatic and asymptomatic patients. The last decade has witnessed an exponential growth in the field of percutaneous transluminal arterial interventions, which has permeated into cervical carotid artery disease. Despite early descriptions of carotid angioplasty and stenting (CAS), only in the last few years has there been widespread interest in this modality.9,10 Vascular surgeons, neurosurgeons, interventional cardiologists, neuroradiologists, and neurologists recognize the significance of this changing technology and have begun prospective randomized studies with rigorous oversight to help guide the debate surrounding CAS.11 Unfortunately, vascular surgeons, representing the minority of physicians performing CAS, remain staunch advocates of CEA and have largely scorned CAS.12 The tide may change with the recent results of 2 trials showing better outcomes in high-risk patients treated with CAS.13,14 In light of these findings, we review our experience with CAS performed exclusively by vascular surgeons in an operating room angiosuite with emphasis on the technical procedure, perioperative complications, and postoperative results. From April 2001 to October 2003, 57 cervical carotid stenoses in 53 patients were treated with CAS at Northwestern Memorial Hospital and the VA Lakeside Medical Center (Chicago, Ill). During this same period, 50 CEAs were done by the primary author (M.K.E.) and approximately 200 CEAs were performed by other members of the Division of Vascular Surgery at Northwestern Memorial Hospital. All CAS procedures were performed by the same surgeon (M.K.E.). Carotid stenoses were located in the extracranial internal carotid artery at the bifurcation (n = 48), the common carotid artery (n = 5), a functional external carotid artery (n = 1), an in-stent stenosis (n = 2), or a previous venous bypass graft (n = 1). Patients either had symptomatic (≥50% diameter) or asymptomatic (≥70% diameter) stenoses of the carotid artery. Patients were excluded if they had a major neurologic deficit or illness impeding informed consent or peripheral vascular disease precluding femoral artery access. The medical records of all patients were retrospectively reviewed using protocols approved by the institutional review boards at the study institutions. The risks and benefits of CAS were explained, and all patients gave informed consent. The CAS was performed in an operating room with dedicated endovascular capabilities. All procedures were done with the direction of the primary author (M.K.E). Preoperative diagnostic studies included carotid duplex ultrasonography with magnetic resonance angiography of the neck and cerebral circulation or a carotid-cerebral angiogram. All patients received 300 mg of clopidogrel bisulfate at least 24 hours prior to stenting, followed by 75 mg/d of this drug. On the morning of the procedure, patients were given 75 mg of clopidogrel bisulfate and 325 mg of aspirin. Percutaneous access was obtained through a common femoral artery puncture. A J-wire (0.035 in) and then a short 6F sheath were used to secure access. A marker pigtail catheter (5F; 110 cm long) was placed in the ascending arch using fluoroscopy. A left anterior oblique aortogram was obtained at an angle of 30o. Selection of the common carotid artery was achieved using a Vitek catheter or DAV catheter (Cook, Inc, Bloomington, Ind). Systemic, unfractionated intravenous heparin (100 U/kg) was given to obtain an activated clotting time of 250 to 300 seconds. A Storq wire (300 cm long; Cordis Corporation [Johnson & Johnson], Miami Lakes, Fla) was used to cannulate the common carotid artery and was then "buried" distally in the external carotid artery. With the Storq wire in place, the short 6F sheath was replaced with a 100-cm-long 6F or 7F Shuttle sheath (Cook, Inc). The distal tip of this sheath was placed 2 to 4 cm proximal to the carotid bifurcation. Angiograms of the intracranial and extracranial arteries were performed with at least 2 different views, anteroposterior and lateral. The lesion was then crossed with the 0.014-in-diameter, 300-cm-long PercuSurge Guardwire (Medtronic AVE, Santa Rosa, Calif) protection system. Intravenous atropine sulfate (1 mg) was given before predilatation. The PercuSurge balloon was inflated in the distal extracranial internal carotid artery, and flow arrest was documented with angiography. The stenosis was predilated with a low-profile, monorail, 4 × 20-mm balloon. Stent size was based on the diameter of the trailing end of the stenotic segment. The self-expanding nitinol stent was deployed over the PercuSurge wire and postdilated using a 5 × 20-mm balloon. Any released debris was aspirated from the stagnant column of blood below the occlusion balloon, and the PercuSurge balloon was deflated. Completion angiograms of the intracranial and extracranial vessels were done using anteroposterior and lateral views. Postoperatively, the patients were sent to the recovery room. If patients remained hemodynamically stable, they were sent to the regular ward. On postoperative day 1, the patients underwent carotid duplex ultrasonography as a baseline study. Surveillance carotid duplex ultrasonography was performed at 3, 6, 9, 12, 18, and 24 months and then annually. Clopidogrel bisulfate (75 mg/d) and aspirin (325 mg/d) were prescribed for at least 1 month and preferably indefinitely. All analyses were performed with SPSS statistical software (SPSS Inc, Chicago). Data are presented as mean ± SEM. All P values were 2-tailed, and P<.05 was considered statistically significant. The clinical characteristics are listed in Table 1. Mean ± SD age was 68.8 ± 1.2 years (64% men  and 36% women ), and overall mean ± SD rate of stenosis was 79% ± 10%. Preprocedural neurologic symptoms were present in 22 (42%) of the group. Indications for treatment included prior neck surgery with irradiation (4), recurrent stenosis (19), fibromuscular dysplasia (1), and severe comorbidities consisting of chronic obstructive pulmonary disease, congestive heart failure, coronary artery disease, or end-stage renal disease (33). Four patients had a known contralateral internal carotid artery occlusion. Technical success was achieved in all 57 cases. The mean ± SD preoperative peak systolic velocity (PSV) was 369 ± 19 cm/s, and mean ± SD preoperative end diastolic velocity (EDV) was 129 ± 9 cm/s. Postoperatively, the mean ± SD PSV was 112 ± 6 cm/s with a mean ± SD EDV of 31 ± 2 cm/s (Table 2). As anticipated, the preoperative vs postoperative velocity data were statistically significant. In 54 of the 57 cases, stents were placed: 46 Precise stents, 13 SMART stents, and 2 Genesis stents (Cordis Corporation). In 4 cases, more than 1 stent was placed during the procedure. Among the 3 patients not adjunctively treated with a stent, 2 had recurrent in-stent stenosis and the other patient, who had fibromuscular dysplasia, had a satisfactory result with angioplasty alone. Mechanical cerebral protection devices (PercuSurge) were used in 44 of the procedures. The mean ± SD occlusion time was 12.3 ± 0.93 minutes (maximum, 30 minutes; minimum, 6 minutes). Percutaneous closure devices (Perclose, Redwood City, Calif) were used in 4 patients. Six complications (10.5%) occurred between the time of surgery and the initial postoperative 30 days. There were 2 minor neurologic complications (3.5%) but no major or minor strokes, myocardial infarctions, or deaths. The first minor neurologic complication was a case of amaurosis fugax occurring 12 hours postprocedure in a patient with symptomatic ipsilateral stenosis. It resolved spontaneously without sequelae. The other case was an intraoperative seizure occurring in a patient with a contralateral occlusion and symptomatic ipsilateral high-grade stenosis. This resolved spontaneously after the resumption of intracranial blood flow. One patient had a brief period of bradycardia followed by intraoperative asystolic arrest during the prestent dilatation, which was treated medically without consequence. Three retroperitoneal bleeds occurred, 1 of which was major and required operative repair, transfusion, and a prolonged hospital stay (11 days). This occurred in a patient who had previously undergone aortobifemoral grafting. There was also 1 femoral artery pseudoaneurysm (<3 cm), which resolved without intervention. The mean ± SD length of hospital stay for all patients was 1.3 ± 0.2 days (minimum, 1 day; maximum, 11 days). After the periprocedural 30-day period, the incidence of fatal and nonfatal stroke was 1.7% (n = 1). This occurred in 1 patient who was receiving warfarin sodium for atrial fibrillation and experienced a fatal hemorrhagic stroke after a fall. Overall, the late mortality rate was 7.0% (n = 4). This consisted of a death due to an indeterminate yet nonneurologic cause at 9 months, a fatal myocardial infarction (MI) at 31 days, a fatal MI at 1 year, and the aforementioned fatal hemorrhagic stroke. Recurrent stenoses occurred in 3 patients (5.0%). One patient developed an in-stent stenosis at 18 months with a PSV of 341 cm/s and an EDV of 126 cm/s. A second patient developed an asymptomatic re-stenosis in a prior venous bypass graft at 9 months (PSV/EDV, 372/128 cm/s; midsegment). Both recurrences were treated only with repeated balloon angioplasty and have remained patent at least 6 months later. A third patient developed a recurrent stenosis at 6 months (PSV/EDV, 613/312 cm/s) within a segment of a prior CEA not originally stented. This was treated with repeated angioplasty and proximal extension of the stented segment. It remained patent at the 6-month follow-up visit (Figure 1). One additional patient had an asymptomatic occlusion of the carotid stent discovered on the 6-month surveillance carotid duplex ultrasonogram. Interestingly, this is the only patient who did not undergo poststent angioplasty during the operation. One of the first and largest randomized trials that evaluated the role of CAS was the Carotid and Vertebral Artery Transluminal Angioplasty Study.24 This multicenter trial randomly assigned 504 patients to endovascular treatment (n = 251) vs CEA (n = 253). Only 26% of the endovascular group was given a stent, whereas the other 76% were treated with angioplasty alone. The stroke and death rate between the 2 groups within 30 days of treatment was no different: 10.0% in the endovascular group vs 9.9% in the CEA group. At the 3-year follow-up visit, the rate of death or stroke was 14.3% in the endovascular group and 14.2% in the surgery group. The investigators concluded that there was no difference in risk between treatment groups. A major criticism of this study is the periprocedural complication rate of 9.9% in the CEA group, which is much higher than that in published reports for CEA. In addition, only a small portion of the endovascular group was treated with CAS. Several other early studies lacking mechanical brain protection systems demonstrated unacceptably high periprocedural neurologic complication rates. These are exemplified by the Leicester trial,25 which was prematurely terminated after enrolling 17 patients when 5 of the 7 patients treated with unprotected CAS developed a periprocedural neurologic event. This unfortunate study was followed by the Wallstent trial,26 which was also prematurely stopped when the 30-day stroke and death rate of 12.1% for unprotected CAS was compared with a 4.5% rate in the CEA arm. The results have vastly improved since the performance of these prior studies and the incorporation of low-profile balloons, stents, and mechanical cerebral protection systems. A recent study by Wholey et al12 evaluated the global experience of carotid artery stent placement in a survey of 36 major centers around the world performing this procedure. Overall, 4749 patients with 5210 diseased carotid arteries underwent CAS. The combined minor and major stroke and procedure-related death rate was 4.6% based on vessels treated and 5.1% based on patient volume. The total stroke and death rate, which included those not related to the procedure such as cardiac deaths, was 5.7% based on vessels treated and 6.3% based on number of patients. This survey suggests that CAS may be performed safely but that there is a learning curve for doing the procedure. The centers that performed fewer than 50 carotid stents had the highest complication rate.27Most surgeons and interventionalists believe that the learning curve is about 20 to 25 cases in the hands of someone possessing advanced percutaneous endovascular skills. Although the results of this survey are interesting, surveys cannot replace controlled clinical trials in assessing the value of major procedures. The 2 recent high-risk trials, Stenting and Angioplasty With Protection in Patients at High Risk for Endarterectomy (SAPPHIRE)14 and Acculink for Revascularization of Carotids in High Risk Patients (ARCHeR13), lend additional support to the efficacy of CAS with the use of cerebral protection devices, reporting embolic retrieval in 57% to 60% of cases. The early results of SAPPHIRE showed a 30-day combined death, stroke, and/or MI rate (including non–Q-wave MI) of 5.8% in the CAS group vs 12.6% for CEA (P = .05). Although these rates were statistically different, this was primarily due to the inclusion of non–Q-wave MIs. The 12-month results showed a continued benefit in the CAS group, which had a major adverse event rate of 11.9% compared with 19.9% in patients who underwent CEA.28 Once again, a statistically significant difference was seen only when analyzing MI rates (2.5% for CAS vs 7.9% for CEA; P = .04). The ARCHeR study demonstrated a 30-day major adverse event rate of 7.8%.13 In similar cohorts of high-risk patients who underwent CEA, the stroke, death, and MI rates were equivalent or higher.29 Ultimately, the Carotid Revascularization Endarterectomy Versus Stent Trial30 investigators will provide the necessary information about the true efficacy of CAS in symptomatic patients. Funded by the National Institutes of Health and the National Institute of Neurological Disorders and Stroke (Bethesda, Md), this study will prospectively randomize 2500 symptomatic patients to either CAS or CEA. When comparing the results of this review with those of NASCET and ACAS, the rates of stroke and death are comparable. The 30-day major stroke and death rate was 2.1% for NASCET and 2.3% for ACAS during the same period. Our study notes a 0% major stroke and death rate; this number is surprising given the previously published 1.2% risk of stroke during cerebral angiography. Carotid in-stent re-stenosis is another critical concern, the results of which do not seem to mirror those of coronary interventions. In this study, we observed 3 cases of re-stenosis following CAS, all of which occurred in women treated for recurrent stenosis after CEA. Our re-stenosis rate of 5% corroborates the midterm experience of others.12 Overall, our study demonstrates that CAS can be performed safely using cerebral protection devices with results comparable with those of CEA. This study underscores the need for vascular surgeons treating carotid artery occlusive disease to possess advanced catheter-based skills and be trained specifically in CAS techniques. Advanced training is a critical component, along with several other institutional factors, that enabled our group to achieve the stated results. Without question, interventional cardiologists and neuroradiologists are technically superior in performing many percutaneous arterial interventions; however, as surgeons, we know that treating carotid artery occlusive disease is more than just doing CAS or CEA. The treatment of this disease process mandates a thorough understanding of the pathologic features, natural history, and adjunctive means available to best treat these patients. This expertise coupled with additional endoluminal stent training, a dedicated angiographic operating room suite, the availability of cerebral protection devices, and a team approach was essential in attaining our excellent results. As the true efficacy and durability of carotid stenting become elucidated through ongoing national trials, individuals from several different specialties will continue to perform these procedures both within the trial setting and independently. Each group will attempt to claim exclusive rights for CAS, and the one able to perform these procedures with lower complication rates than what is seen in CEA will have the most legitimate argument. Therefore, we as vascular surgeons need to develop training programs using simulators, wet labs, or on-site proctoring to increase our success rate with CAS; otherwise our role in performing this procedure will quickly vanish. Accepted for publication March 26, 2004. This study was presented at the 111th Scientific Session of the Western Surgical Association; November 10, 2003; Tucson, Ariz; and is published after peer review and revision. Correspondence: Mark K. Eskandari, MD, Division of Vascular Surgery, Feinberg School of Medicine, Northwestern University, 201 E Huron St, No. 10-105, Chicago, IL 60611 (meskanda@nmh.org).